My life recently has been hard. But not because of hard circumstances. It’s been hard because I’ve made it hard. For the past six months, I was trying to do too much (story of my life), and my family suffered, and I suffered. I was always stressed. Couldn’t sit still with my kids. Always angry at Buc, always nagging, always criticizing. I got angry even if Buc joked with me or tried to be funny with his answers—and his sense of humor was one of the things that attracted me to him in the first place! “I don’t have time for jokes,” I’d snap, literally racing around the house trying to get it livable in time to win maybe fifteen minutes of reading time at the end of the day. I was overloaded. Overtaxed. Strung out. And I wouldn’t admit it, until that sobering talk with my husband. That stressful morning, I finally admitted that the pace at which I’d been living was insupportable. And I admitted that it was time to accept a new reality. I didn’t know exactly what it would look like, but I knew it would involve letting go of a lifestyle that just wasn’t working. If you’ll recall, we hired a part-time nanny last August so I could get some help with the kids and resume some writing/ministry projects. We hired her for fifteen hours a week, with the intent that I’d be gone for most of that time writing or doing other ministry related things; but when her other part-time family let her go (the child went to preschool), she needed more hours. So we gave her more hours. Some weeks it was around twenty-five, more often it was closer to twenty. At first, I thought this was great. I felt incompetent at home, and my kids stressed me out; I felt like I wasn’t a very good mother anyway. So when I was asked to speak at a women’s retreat and co-write a book and pray with three women at my church and form those women into a prayer group last fall—things at which I felt much more competent—I thought life was falling into place swimmingly. We had money to pay the nanny; she wanted more hours; and I wanted to go do what I knew I was already good at. So, I started leaving the house. A lot. During that period of six months, when I often left home, one-third of a book got written. Four talks, complete with powerpoints, were prepared and delivered in Florida at a women’s retreat. And I got invited to do some similar things that are coming up this spring (a magazine cover story, a TV appearance, another women’s retreat). These were and are all great things. But, I discovered, they came at a high cost to my family. Although I believe God has given me a writing/speaking ministry, I started to sense I wasn’t getting the balance with my home life right. And the more stressed I got, the more I sensed I was using the good work/ministry as an excuse to run away from my first work—my family. The first sign that something was wrong was that Buc and I couldn’t stop arguing about housework. I’d hired the nanny to watch the kids, not do housework, and when I started leaving the house more, more domestic things went undone—piling up for me at the end of every day, leaving me perpetually exhausted and resentful. I thought Buc should be happy to help me pick up the slack in the name of the good work I was doing. He thought otherwise; he’d hired the nanny to make his life easier, too, and that shouldn’t include more housework for him. Another sign was Sam’s attachment problems. Shortly after I started leaving the house to go to “work,” Sam gave up touching me. He wouldn’t let me touch or kiss him for a couple months. But in other ways he became clingier. Where I’d previously been able to put him down to bed, no problems, now he screamed and cried when I left, as if scared I was abandoning him. I started staying in his bedroom until he fell asleep every night just to avoid these heart-wrenching scenes. Beyond that, the nanny setup wasn’t training Sam to be self-contained—wasn’t training him to amuse himself while I got house things done during Seth’s naps. No, having the nanny to play with all day made him clingier to me. But it’s not realistic for a mom to play with her kids all day. When the no-touching phase ended (after I made a concerted effort to sit and have more quiet times with Sam), he swung the other way and clung even tighter. He’d learned to expect that I was always leaving the house—so he started keeping tight reigns on me when I was home. And I’d let him, because I felt guilty for being away. He also started waking and coming into our bed in the middle of the night, possibly because he didn’t get enough mom time in the day. And then I resented him because I couldn’t get a moment to breath on my own. As for Seth? He didn’t suffer as much as Sam, because he napped away much of my absent time. But because I felt guilty for being gone, I indulged him more than I should have. As he neared one year of age, I kept getting up with him in the night when he’d mutter, whimper, make little noises, even though he really didn’t need me to. Buc said I’d let him work it out himself when I couldn’t take it anymore, and finally a couple weeks ago, after our nanny quit (read on), I turned off the monitor (our room is next to his, so any loud crying I can still hear). I didn’t hear him at all that night. Or the next. Better sleep is mine. But, for too long I was needlessly wearing myself out. The worst part of the past few months was the stress on my marriage. It felt like there was no tenderness anymore, only rough edges. And that’s because I had not allowed time for tender moments. In order to keep up with my brimming agenda, I had to keep moving at all times—had to keep busy, had to keep on task. And those are not good conditions for growing love and affection. It was another hard lesson, of many. Thankfully, now that I’m heeding the warning signs, things are looking up. Our nanny quit recently,* and though I greatly admire and respect her, it was actually a relief. Don’t get me wrong, I still believe hiring help was the right thing to do. Back in August, I was a new mom of two without family nearby who felt overwhelmed and needed help. And I would still give the advice to “Get Help” to other new moms. But make sure it’s the right kind of help, and in the right amount. Over the past six months, I discovered that what is most valuable to my family right now is not twenty hours of babysitting a week, but several hours of housecleaning a month (so I can be with my kids more) and one or two babysitting sessions each week to get my other things done. I didn’t know, when I hired my nanny, what kind of help I most needed, so I didn’t set up expectations and schedules in the way that would most benefit my family. After our recent hard lessons, though, I am able to make much wiser decisions when it comes to hiring help for my family. And I have a happy update about this. If you’ll also recall, we hired a cleaning lady last summer to clean twice a month. Well, after the nanny quit, I knew I would probably need some kind of babysitting to replace a little of what I’d lost (still no grandparents here in Missouri). My biggest problem was I didn’t want to introduce a new person into my kids’ lives after Sam’s separation issues. I mentioned to my cleaning lady that the nanny had quit, and what do you know? In addition to cleaning houses, she also nannies, and she offered to spot me one or two sessions per week of babysitting, fitting it around the cleaning schedule. Best part? My kids love her. And bonus: she’s one of my readers; she understands my non-housework “work,” and she wants to help me continue it (in the appropriate balance, of course). I am so thankful for God providing Janice right from under my nose! Thanks, Janice, for stepping in! I wish I would learn earlier the lessons God is trying to teach me. I wish I would heed the signs that life is spinning out of control before I come unglued. Unfortunately, I don’t often “get it” until I break down, or wear out, or get to the end of my rope. That’s when I finally seek God and really listen to my husband’s assessment of my current crazy; that’s when I’m open to change. Now that I’ve gotten really honest and admitted these hard lessons (i.e., my mistakes), I hope I have encouraged you to learn your lessons sooner than I did. To heed the signs. And what are the signs? If you find yourself knocking your head against a wall every day and night, if you easily explode at your family and have no reserves of peace (and no time to build up those reserves), if you are running on empty and the pace of life seems insupportable and just too hard…then it is. I encourage you to admit the broken pattern and do something about it. If you realize that something needs to change but don’t know what it is, spend some time in prayer asking God what your first steps should be. (Prayer is always a great first step.) If you are having a prayer block, which can happen when we are too busy and strung out to sit still and listen to God, start by asking some godly friends or family members for their take on what needs to change; perhaps they can spot the problem you can’t, and get you back on the right track, as Buc did for me. May God help us all to heed the signs when life not going as it should (and when we have power to do something about it). The quicker we are to obey God, the faster we will be to learn his lessons, and they won’t have to be so hard. May he help us to listen to his good and perfect plan and be obedient to live it out. *We traveled too much, our nanny said, and she needed more regular income. When a full-time family came along, she took a position that fit her needs better. I am glad for the time she gave us and for what I learned from her. I am also glad that now we’ve both found situations to better fit our needs. 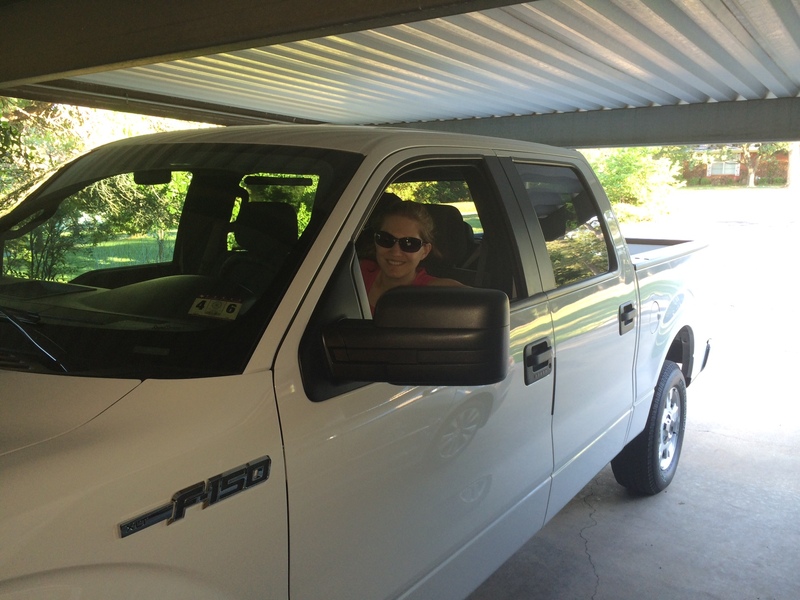 I am thankful this morning for unexpected good things, including my new Ford F150 (our first family vehicle) and Duck Dynasty. That’s a sentence I never thought I’d write. I never pictured myself driving a truck as my primary vehicle, or watching those “silly” rednecks by choice. My main focus for now is still working on my book during naptimes—now I’m on to my book proposal, with a particular editor in view. But in the meantime, God continues to fill my life with other interesting stuff, and I’m glad for it. For instance, I’ve made a new friend in my next-door-neighbor, who gave birth to twins two weeks before Sam was born. She has been such a blessing to this homebound mama, because she has become almost like a “coworker” (in the business of mothering babies) to commiserate with and compare stories. (We SAHMS miss that coworker/adult banter.) We take the babies for walks once or twice a week, swap books, discuss those books (a built-in book club! What could be better? ), and text each other. Tonight we will attempt a movie night at her house once the babies go to bed. God has given me lots of friends over the past few years, and I love their awesome uniqueness equally, but there is something to be said for having friends, and family, close by. Logistically, you can do so much more with family and friends who are physically close. Construction, and reconstruction, on parts of our house continues—now we are moving into month two. I skipped writing about it when it began, but the short version is that a plumbing leak led to gutting a bathroom and a hallway, and the resulting insurance money spurred us to proceed with other home improvements we’ve wanted for five years. So lately most days around here are noisy and messy, with subcontractors tromping in and out of my backyard and the back rooms of the house. Included in the work are new walls (to replace sliding glass doors), a new window, new carpet, and new paint. I’ll be glad to get this over with, but with the mess around me, my next home project may become purging more of our junk. Duck Dynasty. I rolled my eyes a couple years ago when some family members described the show, but now my husband has introduced me, and I’m hooked. This is the only television I watch besides a half hour of morning news, mind you. I could easily live without a television. But this show makes me laugh at the end of a hard day; plus, I am encouraged by the Robertsons’ strong example of family togetherness and their un-ashamedness of their faith. Speaking of faith, my new neighbor friend asked if I would like to read through the Bible with her in forty days to refresh ourselves on the big picture of God’s Word. I said sure, but it definitely won’t get read in forty days! More accurately, I read from two to five chapters a day (I’m almost to Leviticus, and I’m thinking of skipping it this go-round…anyone want to hold that against me?). The more I read the Bible, the more new insight I get. This time I’ve picked up on a couple new things. One example is in Exodus 20, where, directly after God gives the 10 Commandments, he repeats the injunction not to worship or make other Gods—making a special point to warn them of the exact sin he knows they are about to commit with the golden calf! In the instructions for building his temple, I am reminded that God pays attention to detail, and he cares for the details of our lives. In his instructions to hire skilled workers, I take encouragement for my book project that God wants us to be skillful in our trades, and thereby glorify him. P90X. The weight loss effort continues, with s-l-o-w success. I am still twenty pounds away from my goal (pre-pregnancy weight). But I am working out 3 to 4 times a week after Sam’s bedtime, usually with one of these extreme workouts, so I resist feeling bad about the weight that won’t (yet) come off. I’m doing my part—also trying to eat right—and I can’t do more than that (unless I give up chocolate like my neighbor…and I’m not quite ready for that!). What else? Sam is doing great. He’s had a few bites of rice cereal, so that will probably become part of the routine soon, to keep up with his nutrition needs. He is spitting up A TON…but I hope that will level off soon with him taking some cereal. Also, my one-day-a-week babysitter, my sister-in-law, is done now that her kids are out of school. So Sambo and I get lots of quality time! Hubby took Monday and Tuesday off for the holiday weekend (which was so nice for our family! ), and when he had to watch Sam from about 2 to 4:30 one day (Sam’s fussy time), he asked me how I do this every day! Like with anything and everything else in life, the answer is with God! This post has been a hodgepodge of goings-on, and I want to end by thanking my Creator (and Re-Creator) God for all of them. My life is so full right now I almost don’t know what to do with myself! But once upon a dark time, I didn’t even want to see the light of day. When I think of the depression he brought me out of years ago, there is only one conclusion to be made: God is worthy of my worship, every single day, and every single moment of this crazy, busy life!